Also i have noticed in several VR apps that when tracking one hand there is no problem but when another enters the screen then the refresh rate of hands go way down to 5-10fps. Anyone else has this and is there an fix to it? Do you mind providing a screenshot of your hands in the visualizer so we can see what it looks like? The orientation of your hands flipping may be due to the auto-orient tracking option in the Leap Motion Control Panel. You can try disabling it to see if that resolves the flipping. Auto-orien tracking helped things a little bit but glitching still remains. I will record an video soon so you can see how it reacts to my hand. When i just have the hand still with back side of hand and tattoo visible the hand in visualizer jumps around, fingers move and stutters to every direction and usually it detects it as a new hand (isn't change in color that?) pretty frequently. Yes, the change in color of a hand means that the hand gets reinitialized. Could you have someone with no tattoos test the sensor so we can check if it is indeed the tattoos causing issues? A video of the issue occurring would also provide more information for us. Well my other hand is working fine without the glitches. I will try to do the video asap. Thanks DARKKi! Once you've provided the video, I will forward this thread to our engineering team to investigate. 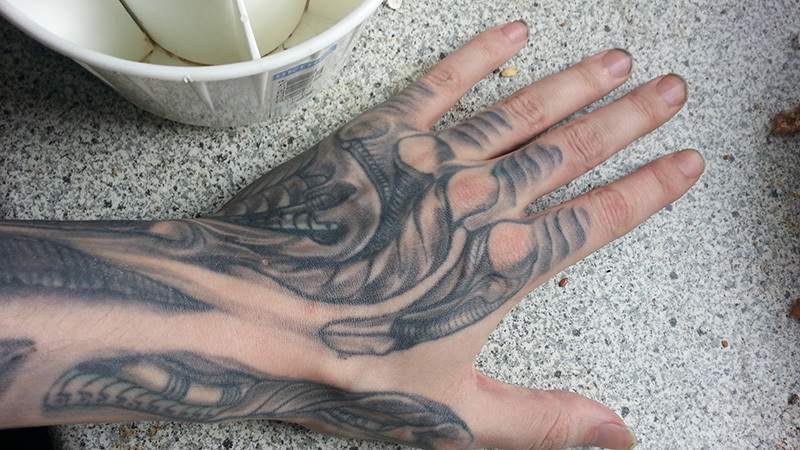 In the beginning i use my normal hand and then switch to one with the tattoo. I've heard back from our engineering team. Unfortunately, Tattooed hands are completely black in infrared. This will impact tracking, as the hand appears to have very different characteristics than a non-tattooed hand. Our team is discussing some possible improvements to our tracking software to see if we can be more robust to in the future. As a temporary workaround, you may be able to wear a cotton glove on your tattooed hand. Little OT question. In many games when just one hand is present tracking works fine but when other hand comes into picture hands "fps" drops to stuttering levels. Is there an fix for this or is this discussed somewhere? What are the specs of your machine? I don't think I've seen the fps drop once a second hand gets tracked. Does this occur in all apps or just the visualizer? It does not occur in visualizer it only occurs in apps. Your system pretty solid so I don't think that should be causing any issues. What apps does this occur in? Is it only some apps or all apps? Thanks for the additional information. I've forwarded it to our engineering team so we can work on improving this functionality. I was wondering if a solution already has been found or at least the cause of the problem with the FPS drops. Since a long time has passed you might have found more information about the problem. I'd like to hear about that.